Alpha1-antitrypsin deficiency (AATD) should be suspected in any person who presents with early onset emphysema or COPD, regardless of his or her of smoking history. And, in those individuals with unexplained liver disease at any age, including obstructive jaundice of infancy. Definitive diagnosis of AATD is most frequently accomplished with use of a combination of biochemical and/or genetic tests. Therefore, AATD testing should be seen as a laboratory diagnosis and not as a clinical diagnosis,  and the healthcare provider should maintain a low level of suspicion as the diagnosis is often missed. Serum alpha1-antitrypsin levels are used to identify disease and determine levels. The study is most commonly performed by nephelometry. Testing is readily available in most clinical laboratories and is inexpensive and underutilized. The AAT Deficiency Task Force of the American Thoracic Society (ATS) and European Respiratory Society (ERS) had published standards guidelines aimed at improving clinical recognition of AATD and avoiding underrecognition or misdiagnosis. Serum testing is used for diagnostic testing and predispositional testing as in those patients with family histories compatible with alpha1-antitrypsin deficiency or with siblings with known alpha1-antitrypsin deficiency. However, guidelines from the ATS/ERS AAT Deficiency Task Force do not recommend predispositional fetal testing or population screening unless the prevalence of AATD is high (>1 case per 1500 population), smoking is prevalent, and adequate counseling services are available. 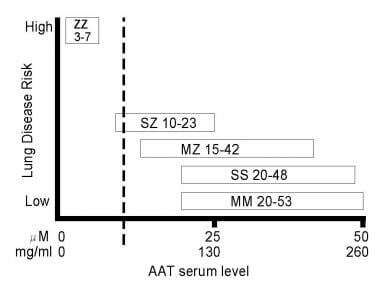 Most hospital laboratories report serum alpha1-antitrypsin levels in milligrams per decimeter, with a reference range of approximately 100-300 mg/dL. Levels less than 80 mg/dL suggest a significant risk for lung disease. Reference laboratories usually report the serum levels in micromolar concentration, with a reference range of 20-60 µmol/L and a threshold level for emphysema at 11 µmol/L. Test patients with low or borderline serum levels with phenotyping (serum levels < 100 mg/dL). Alpha1-antitrypsin phenotype determined by isoelectric focusing (IEF) is the most commonly used method to definitively detect the alpha1-antitrypsin phenotype that indicates a risk for AATD. It is considered the criterion standard test for identifying alpha1-antitrypsin variants, but involves complex interpretation. [3, 9, 15, 16] Use an experienced reference laboratory for this test. Phenotyping with dried blood-spot samples, by using a blood drop absorbed on special paper, permits easier transport of samples and is suitable for screening purposes, but the identification of a deficient variant should be confirmed with serum or plasma samples. Patients and healthcare providers can obtain a free Alpha-1 Test Kit (finger-stick test) from the Alpha-1 Research Registry at (877) 886-2383, which is associated with the Alpha-1 Association. The test sample can be submitted directly to the Registry at the Medical University of South Carolina. The test screens for the most common Z and S genotypes. If more extensive testing is needed to determine an alpha1-antitrypsin level, both patient and physician are notified. There is no charge for the Alpha-1 Screening Program. Phenotyping is required to confirm AATD. Do not initiate alpha1-antitrypsin replacement therapy without testing. More than 100 phenotypic variants of AATD have been identified, but one phenotype, PiZZ, is responsible for nearly all cases of AATD emphysema and liver disease. PiZZ phenotype serum levels range from 3.4-7 µmol/L, about 10-20% of the reference range levels. Other phenotypes associated with alpha1-antitrypsin emphysema and liver disease include PiSZ and PiZ/Null. PiNull/Null is not associated with liver disease but is associated with alpha1-antitrypsin deficiency emphysema. In rare circumstances, a third test is used to evaluate a patient with clinical features that are highly suggestive of alpha1-antitrypsin deficiency but whose serum levels are within the reference range. Specialized laboratories can perform a functional assay of alpha1 antiprotease, which measures the ability of the patient's serum to inhibit human leukocyte elastase. Such a defect is extremely rare. Diagnosis at a molecular level (ie, genotyping) uses DNA extracted from circulating mononuclear blood cells. This genotyping is accomplished using DNA amplification techniques with melt-curve analysis. Greene et al. established a reference compendium of known AAT phenotypes that can be used as a resource for interpreting AAT phenotypes. Test kits capable of detecting S and Z alleles on samples from mouth swabs have made genetic testing easier. The presence of rare null alleles can be inferred by genotyping, because null alleles do not produce protein that can be identified by a band of isoelectric focusing field. These tests will, however, miss the rare null alleles. Evaluate hepatic function in patients with low or borderline levels of alpha1-antitrypsin. Measure serum transaminases, bilirubin, albumin, and routine clotting function (activated partial thromboplastin time and international normalized ratio). 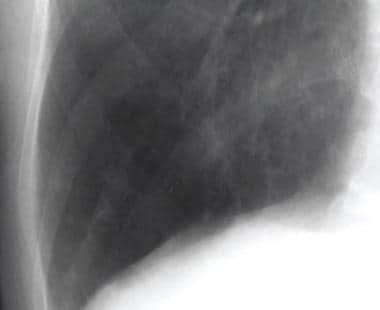 Alpha1-antitrypsin deficiency (AATD) emphysema produces a hyperlucent appearance because healthy tissue has been destroyed. The process is not uniform; certain areas are affected more than others. Affected regions also are described as oligemic because they lack the normal rich pattern of branching blood vessels. An unusual characteristic in alpha1-antitrypsin deficiency is found in about two thirds of PiZZ patients; the emphysema has a striking basilar distribution. In contrast, cigarette smoking is associated with more severe apical disease. High-resolution CT (HRCT) scanning of the chest demonstrates widespread abnormally hypoattenuating areas resulting from a lack of lung tissue. 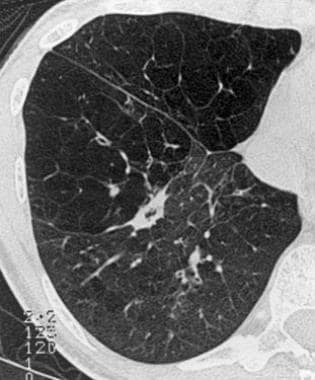 As in smoking-related emphysema, the appearance has been described as a simplification of lung architecture. As tissue is lost, pulmonary vessels appear smaller, fewer in number, and spread farther apart. Mild forms of alpha1-antitrypsin disease can be missed on HRCT scanning. However, when the disease is moderate, discerning the panlobular nature of the process and the characteristic lower zone predominance is possible. Severe forms may be indistinguishable from severe centrilobular emphysema. The severity of emphysema is best documented with standard pulmonary function tests. Spirometric determination of forced vital capacity (FVC) and forced expired volume in 1 second (FEV1) are essential. Determining lung volume (preferably by plethysmography) and measuring diffusing capacity provide additional valuable information. Patients who are symptomatic at the time of diagnosis usually have moderate-to-severe airflow obstruction with an FEV1 in the range of 30-40% of the predicted value. Reduced vital capacity and increased lung volumes secondary to air trapping (residual volume >120% of predicted value) are usually present. Diffusing capacity values are reduced substantially (<50% of predicted value) in most symptomatic patients. Alpha1-antitrypsin-deficient individuals who are identified by screening programs or because a relative has been diagnosed with the disease may have few or no abnormalities. All forms of emphysema destroy alveolar walls and leave permanent abnormal enlargement of the airspace distal to the terminal bronchiole. In alpha1-antitrypsin deficiency (AATD), the emphysematous areas are distributed uniformly throughout the acinus (lobule) and, for reasons that are not known, more commonly in the basilar portions of the lung. This contrasts with centrilobular emphysema characteristic of cigarette smoking, which predominantly affects the respiratory bronchioles in the central portion of the lobule, initially at the apex of the lung. Pathologic features from liver biopsies have shown to be nonspecific and variable depending on the classification and staging of the disease. The presence of PAS-positive globules may suggest AATD, and further investigation it is recommended. Biopsy findings cannot replace IEF as a mode of diagnosis. No specific grading system exists for alpha1-antitrypsin deficiency (AATD), but the severity of the emphysema that it creates can be staged using the body mass index, airflow obstruction, dyspnea, and exercise capacity (BODE) index. This 4-step evaluation of patients with chronic obstructive lung disease appears to identify a population with limited survival who might benefit from intensified therapy. The index has not been evaluated in a population of individuals with AATD.